Geoffrey Hayes’ THE BIG NO-NO! 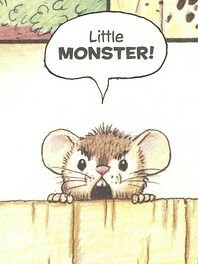 is his second Toon Book that follows the adventures of two little mice; Penny and her jerky brother Benny. In the first pages we see Benny in all of his belligerent glory. Anything his sister likes Benny treats contemptuously for no discernible reason other than plain meanness. 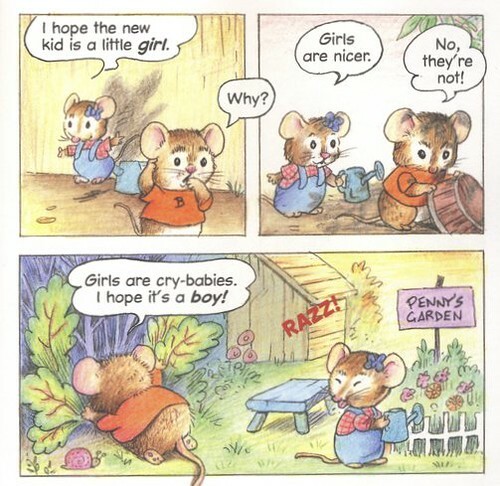 When Penny blithely tells him she hopes their new neighbor is a girl, he pulls out that wonderful old notion that girls are all “crybabies.” It’s a wonder Penny still has such a sweet personality what with having to deal with her brother’s rotten attitude all the time. When their sand pail goes missing, Benny immediately assumes their new neighbor has stolen it. He insists that he and Penny should commit a “big no-no” and climb the fence to get it back. When they get there Penny is delighted to see their neighbor has assembled a collection of mud pies with flowers on top. Benny, of course, could care less and snatches up what he thinks is their pail. 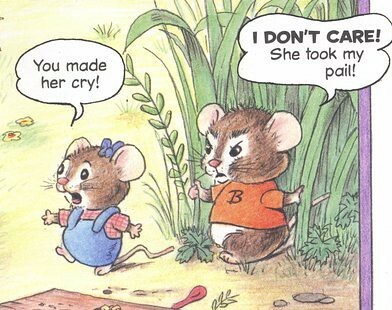 But when the new kid - a little girl mole - returns, things get ugly. Thanks in no small part to Benny’s fear-mongering, a few simple misunderstandings escalate into an all out brawl. Everyone pelts each other with clods of dirt before the siblings escape over the fence. Now it should be noted that Benny at least acts honorably here and defends his sister from attack. Once home, Penny finds the missing pail in their own yard. For a second time Benny decides to do the right thing and return the pail. The kids actually get to know each other after this and become friends. Then the most remarkable thing happens. After hurting himself with a rake Benny cries like a banshee. 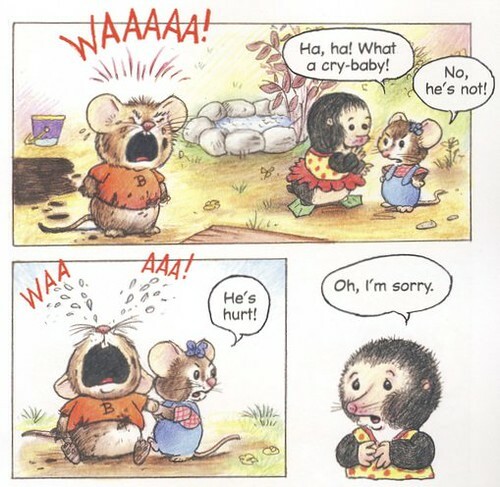 The mole laughs and calls him a crybaby (oh the irony). But Penny steps up and defends her jackass brother. Even after all of his derision, even in the face of such poetic justice, Penny acts with love and charity. What a gal. Geoffrey Hayes is an excellent fit for the Toon line. The gentle line work has a warm traditional feel. Kids who dig the art of Beatrix Potter or Cyndy Szekeres would probably respond to this immediately. This isn’t his first Toon book and I hope he makes more. Maybe a comic called PENNY AND HER NEW FRIEND GO OUT TO PLAY AND THEY LEAVE BENNY AT HOME BECAUSE HE’S AN ANNOYING JERK. I’ve got plenty more good ideas like that, Geoff, give me a call. The mole kind of resembles Bela Lugosi in The Ape Man. We simply had our fence replaced these days. The rest of the crew was excellent. The estimate through Sean ended rapidly with the proper amount of detail to make a decision to use BEST FENCE CONTRACTOR website. The team turned up on time as well as quickly got the work done also it looks beautiful. Very pleased with the outcomes, many thanks!